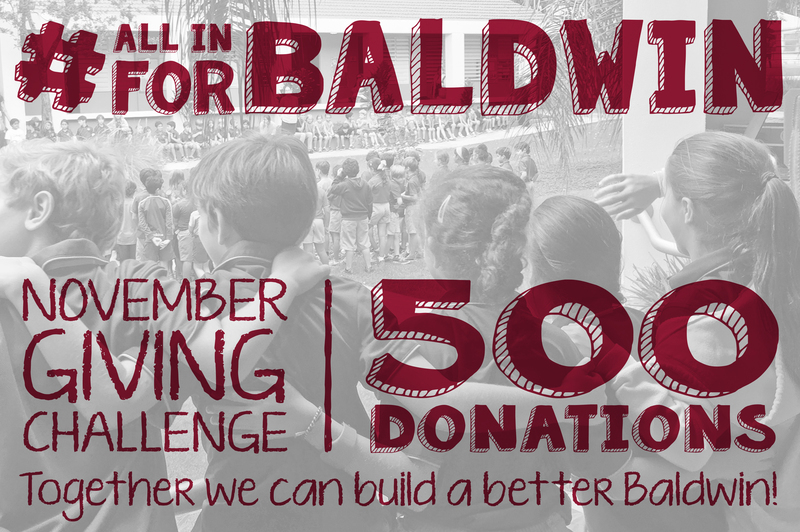 This campaign ended on November 30, 2016, but you can still make a gift to Baldwin School of Puerto Rico by clicking here! An Anonymous Donor gave $1,000 because 250 donors made a gift in 30 days. Become an Advocate for this challenge by sharing in your social media. When you generate 1 or more donations we will send you a set of Baldwin earbuds! Become an Advocate for this challenge by sharing in your social media. When you generate 5 or more donations, we will send you a Baldwin USB 4GB flash drive! The first 20 people to donate $50 will receive a Baldwin Bulls notepad! The first 10 people to donate $100 will receive a Baldwin Bulls visor! The first 5 people to donate $150 will receive a Baldwin portfolio and pen! The first 5 people to donate $250 will receive a Baldwin Bulls athletic polo shirt! When you donate $500, you will automatically be entered in a raffle for VIP SEATING FOR 6 IN THE VPAC at an event of your choice within Dec 2016 - Dec 2017! Join the Bandits Circle. When you give $2500, a plaque etched with your name will be added to the base of our Giving Tree. Join the Founders Circle. When you give $5000, a 4x8 inch brick paver engraved with your name will be installed along the Giving Tree path. Join the Headmaster's Circle. When you give $10,000 or more, an 8x8 inch brick paver engraved with your name will be installed along the Giving Tree path. At Baldwin, we strive to inspire a passion for learning and to empower each child to take responsibility as an open-minded, principled citizen in a global community. We take seriously our commitment to investing in the people and programs that make Baldwin the school of choice for so many families. No gift is too big or too small...every gift counts! Your gift is deductible to the full extent allowed by tax law. There is no better investment than the education of our children. When you make a donation, you are helping us build a better Baldwin, a better Puerto Rico, and a better world! The Annual Fund: your unrestricted donation helps us maintain a high-quality educational experience for our children in an ever-shifting economic environment. This fund supports the continued growth of educational programs and infrastructure at Baldwin. In spite of the uncertainty of our times, we are fully committed to a world-class experience for our students. The Capital Campaign for the Innovation Center: you can help build our much needed new libraries, and center for science, technology, and engineering. The Scholarship Program: you can help a student with limited financial resources obtain a full tuition, lunch, supplies, and support from 7th - 12th grade. The Summer Institute for Public School Teachers and Students: you can support professional development opportunities for public school teachers and academic enhancement for 3rd, 4th, & 5th grade public school students. Support the Baldwin Experience and Grow With Us!